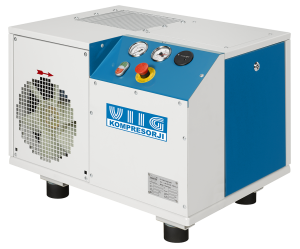 The VIIG RS-B compressor range was developed for users who have limited space available or lower requirements but still want to seize all the benefits of a rotary screw compressor. RS-B compressors are available as freestanding units to be integrated freely into any existing system or as the VIIG RSD-B versions with a 90- or 250-litre pressure vessel. For more demanding customers, we also have the VIIG RSDK-B version, which, in addition to the compressor and pressure vessel, also includes a refrigerated air dryer for drier, higher-quality compressed air. Compressors can be combined not only with regular but also galvanized pressure vessels.